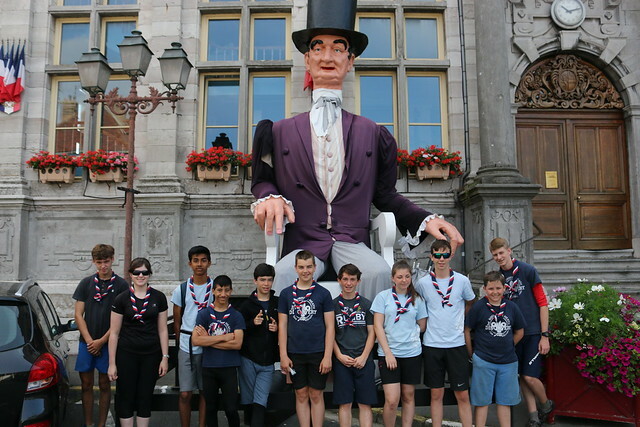 The 3rd Squirrel’s Heath Scouts and Zenith Explorers have just returned from yet another successful trip abroad, this time to the town of Ypres in Belgium. After our visit to Normandy last year, this trip had a lot to live up to and it didn’t disappoint. The Scouts and Explorers cycled an amazing 205 miles whilst exploring the region of West Flanders, taking advantage of the many beautiful cycling routes to be found there. Despite having to get up extra early in order to avoid the queues at Dover, we tackled our first day with gusto, navigating the tricky waters of the port with ease and cycling a further 30 miles after arriving at Dunkirk in the early afternoon, battling the heat all the way. We reached the Belgian border that night and settled in our first campsite of the trip to cook our evening meal. On the second day we reached our main campsite in Kemmel, a village outside of Ypres, called Camping Ypra, after visiting the Flanders Museum in the Ypres Cloth Hall. This gave us a taster of the week to come, as we learned about the three battles of Ypres in WW1. As if cycling wasn’t tiring enough, we decided to climb to the top of the Bell Tower to enjoy fabulous views of the surrounding countryside. Then it was on to our base camp for the week. The short but steep ascent up to the campsite was met with the battle cry of ‘I thought Belgium was supposed to be flat!’, but was conquered nevertheless. So began our epic adventure cycling to and fro from Ypres, in order to find out a little more about WW1 and also to experience all this truly beautiful town had to offer. We danced the Irish jig at an open air concert, made clay pots at Stefan’s Pottery and tried our best to escape from a locked house in the Longest Hour by solving puzzles, with one team succeeding and claiming victor’s rights the rest of the trip. We’ll have to return to Belgium in a few years to see our contributions to the ‘ComingWorldRememberMe’ art project as we each made a clay statue to represent one of the soldiers who died in the war. A highlight of the week was when we tried our hands at making chocolate, though it’s questionable how much of the chocolate survived production and made it to the finished project! Following the Ypres Salient Trail around some of the major battlefields of WW1, we also visited Hill 60 and Hill 62, where we learnt the history about some of the biggest battles. The most daring of us ventured deep into the trenches at Sanctuary Wood, crawling through pitch black tunnels in order to find out what it would have been like for the soldiers who fought there. Our experiences here were made particularly poignant by our visits to Essex Farm Cemetery and Tyne Cot, where we paid our respects by laying a wreath. But our biggest battle was trying to rescue a Scout’s shoe from a terrible fate in a mud filled crater! It was an incredible honour for our Scouts and Explorers to participate in the Menin Gate Ceremony on Thursday 28th July. Listening to the Last Post, whilst standing in that amazing memorial, holding the Union flag and looking out at our incredibly smart Scouts and Explorers, was one of the proudest moments of my life. For everyone involved, it was an emotional and unforgettable event. We hope Belgium won’t forget us, because we certainly will not forget this trip. Even with the trials of camp life in the countryside – being chased up country lanes by tractors for example, or slaving away over the washing up, or the never ending quest for tea bags – there is no doubt that we all had a great time. Thanks very much to our fantastic Leadership Team, brilliant Support Crew and enthusiastic parents for making this trip so special and well done to all the courageous Scouts and Explorers who took part. Congratulations to all our Chief Scout Award Achievers! Romford Scouts Walk for Paul!